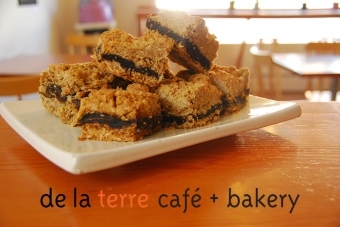 de la terre Café + Bakery is a cafe in Jordan, Ontario serving light meals, drinks (brewed and distilled), pastries and sourdough bread. We believe in good food prepared properly and delivered fast. We source as much local produce and products as possible and use only organic poultry andhormone-freee beef and pork. Join us for a great meal in Jordan Village, vegetarian/vegan options available.